This download includes 2 pages of basic questions that can be answered about any story. It asks for the Title, Author, Illustrator, Setting, Main Character, Plot and Favorite Part. 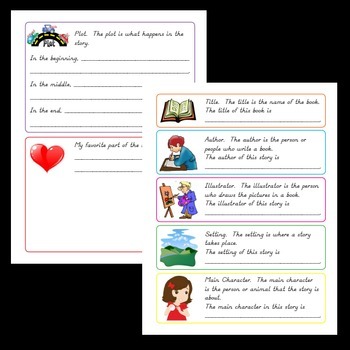 You can use these with any story all throughout the year! To make them 'interactive', have students cut them out and glue the left side into their writing journals. That way they can draw pictures or write beneath them to make a 'lift the flap' sort of book.